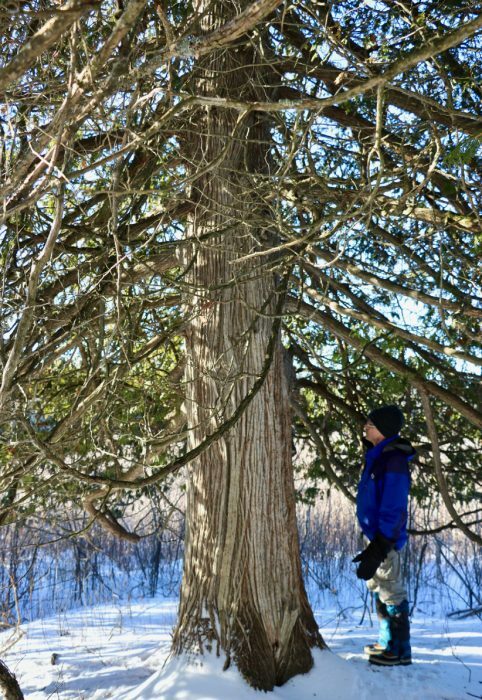 “I want to report a very old tree,” said Kevin Keough, announcing an unusual sighting among all the expected bird and mammal observations reported by members at the Club’s January meeting. Kevin and his wife Agnieszka had been exploring the frozen reaches of Goodwin Marsh by the Macnamara Trail. He described the tree as a stout, heavy-limbed, and very healthy Eastern White Cedar (Thuja occidentalis). My interest was piqued! I arranged a visit to the tree by Owen Clarkin, well-known tree enthusiast with a deep knowledge of tree ecology. On a very cold, but sunny Saturday morning, Kevin and Agnieszka led us onto the sparkling snow of the Macnamara Trail. We crossed the West Link and turned right onto the Nopiming Loop Trail, part of the new trail extension. We headed out onto the “Island Chain”, which is a future one-way trail that will lead to a lookout over Goodwin Marsh. An impressive and clearly very old cedar was growing on the fourth small, rocky island. A standard measure for trees is Diameter at Breast Height (DBH), taken about 4 feet above the ground. We measured the tree’s circumference at 89”, which gives a DBH of 28”. 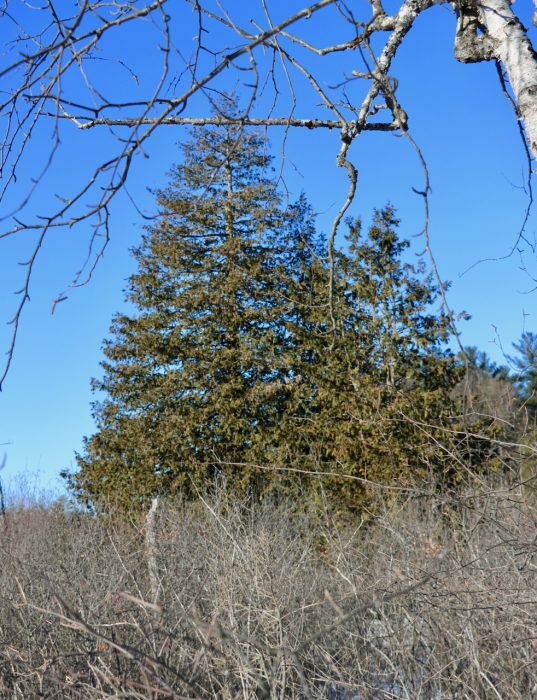 White Cedars in Ontario grow slowly, roughly one foot in diameter every 100 years.1 This metric indicates that our Macnamara Trail tree may be about 230 years old, which means it started growing in the late 1700’s!2 The town of Arnprior was founded in 1823. “I think I know the tree he’s going to show us,” Owen said to me in the car on our way to the site. In preparation for building the trail extension, the Club had run a bio-inventory in May 2017 on the north side of the Nylene Canada property including the Island Chain. Owen had participated in the bio-inventory and remembered noting a very large cedar. He entered it as an observation in iNaturalist3, but hadn’t measured it. Now we had its DBH! How can you tell a tree is old? Some people think it’s about height, but this is not a reliable indicator since many old trees are squat, having damaged or broken main trunks. Some like hemlock just grow slowly especially in shaded conditions. Our Goodwin Marsh tree is not tall, maybe 40 feet, and it has two other key old tree characteristics. Its stout trunk is uniform in size for most of its height; young trees have tapered trunks. And its oldest limbs are large in diameter and twisted. However, uncharacteristic for an old tree it has retained a healthy, well-shaped crown. 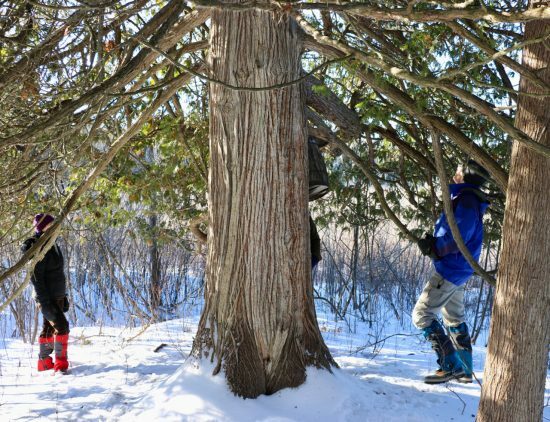 Kevin and Owen measure the second large white cedar. 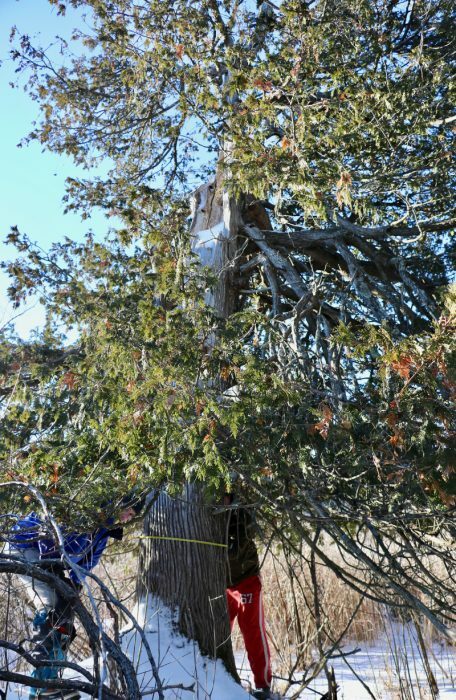 Kevin pointed out a second large white cedar on an adjacent island that was missing half its crown. This tree was 24” in diameter so about 200 years old. A side branch had become a new leader as the original leader had split off from the trunk. Kevin’s and Agnieszka’s discovery on the frozen winter marsh has drawn our attention to two historic treasures that we can look forward to admiring on the future trail out to Goodwin Marsh. 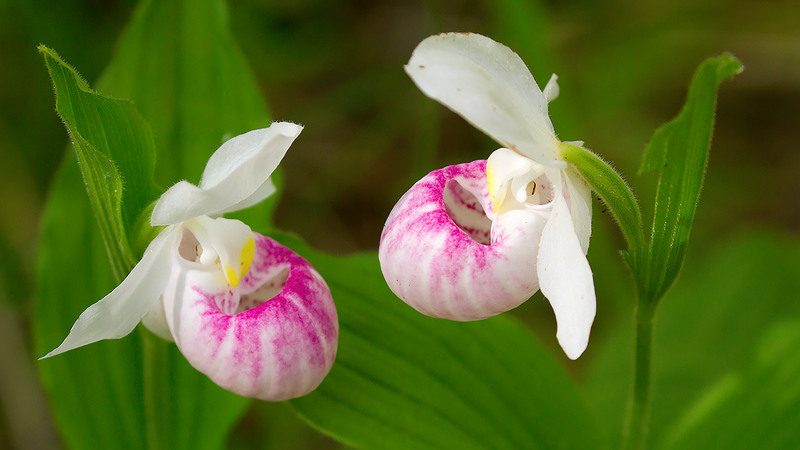 Information about them will be added to our updated trail guide for visitors to appreciate. 1 Harlow and Harrar’s Textbook of Dendrology states that cedars grow one foot in diameter in 66 to 100 years on the best sites. The longer time period is for short season areas. 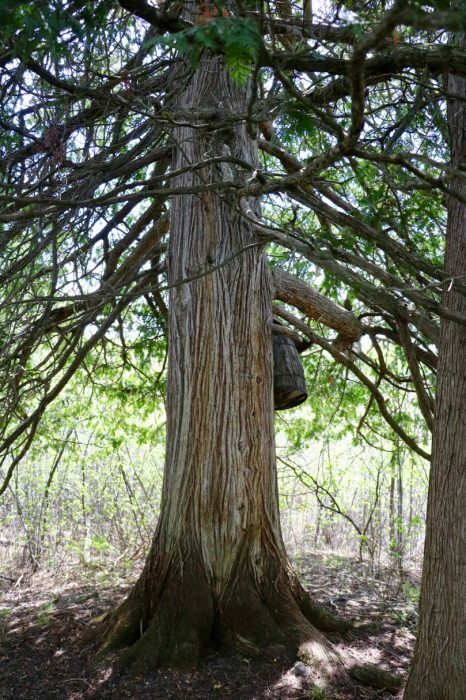 2 A similar cedar tree in Stittsville with a circumference of 90” (diameter of 2.4 feet) was cored and found to have 253 rings. Historic cedar on the left showing a healthy, symmetric crown. Large and twisted side branches are indicative of an old tree.